A NASA report stating that it was "unprecedented" that melting was taking place on 97 percent of Greenland's ice cover was criticized by people who doubt that global warming is actually occurring. The critics point out that the current melting may be part of a regular planetary cycle that recurs approximately every 150 years, with the last one happening in 1889. Furthermore, they say that the current fires in the west coast and the drought in the central and southern part of the U.S. are just variations within the normal range of weather patterns and are not the result of global warming. Is global warming real, or is it an exaggeration? If it is real, and if it is caused by the carbon dioxide emissions from burning fossil fuels, there is something that we can do about it by switching to alternate sources of energy. If we don't do anything about global warming, there are serious consequences. 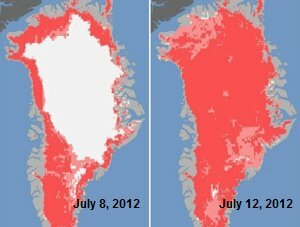 Two major things will happen: 1) as the ice in Greenland and Antarctica melt, the sea level will rise by several feet flooding coastal communities around the world, and 2) the shrinking glaciers and snow cover in the mountains will decrease the flow of fresh water in the rivers thus reducing our crop yields and our food supply. Some scientists have predicted that there will be a mass extinction event in about 200 years if nothing is done about the rate at which we are putting carbon dioxide into the air. Basically, we are killing ourselves and many other fragile life forms with our pollution. After humans are gone, other life forms will inherit the Earth. The following video shows a huge newly discovered rift in Antarctica that will create a giant glacier when the ice finally breaks. You may hear about this in the news soon.